RECOMMENDS that Parties follow the Guidelines for management of nationally established export quotas that are annexed to this Resolution. 1. This document specifies a number of general principles regarding the establishment and management of annual export quotas at the national level in the context of CITES. It is understood that there may be exceptions and reasons for departing from these general principles in certain cases. In particular, it should be noted that certain exceptions may be found in Resolutions of the Conference of the Parties, which take precedence over these guidelines. 2. In the context of CITES, an annual export quota is a limit on the number or quantity of specimens of a particular species that may be exported from the country concerned within a 12-month period. An annual export quota is not a target and there is no need for a quota to be fully used. It is recognized that there are some cases in which it is likely that the export of specimens removed from the wild will occur after the year in which the removal took place, as happens with hunting trophies. 3. An export quota system is a management tool, used to ensure that exports of specimens of a certain species are maintained at a level that has no detrimental effect on the population of the species. The setting of an export quota advised by a Scientific Authority effectively meets the requirement of CITES to make a non-detriment finding for species included in Appendix I or II and, for species in Appendix II, to ensure that the species is maintained throughout its range at a level consistent with its role in the ecosystems in which it occurs. 4. A well-implemented export quota system can be an advantage for any Party to CITES that authorizes exports. It eliminates the need for a non-detriment finding for each individual shipment of CITES specimens, provides a basis for monitoring the trade and may facilitate the issuance of export permits. In the case of species whose populations span international borders, the establishment of export quotas can be coordinated at a regional level, which is of particular relevance in the case of migratory species. 5. It must be recognized, however, that there are also other management tools that may be better suited to the biological, administrative or other management context. In some cases, the use of quotas could have an undesirable effect, particularly if they are not adjusted as necessary to take into account changing biological, legal or administrative needs. For example, where a quota has been set for a particular year but the species is impacted by climatic factors, such as a drought, there could still be pressure to fill the quota. 6. The fundamental principle to follow is that decision-making regarding the level of sustainable exports must be scientifically based, and harvests managed in the most appropriate manner. This requires that implementation, including administrative, legislative and enforcement measures, take account of the regulatory and biological context. 7. In contexts where the establishment of an export quota would be the most effective management tool, it is important that the use of that tool is not made less attractive to exporting countries by the imposition of unnecessary administrative layers. For this reason, the guidelines in this document have been prepared with the thought in mind that they need to be practical and uncomplicated, and not to add to the existing administrative burdens. 8. Where export quotas have not already been agreed at the international level (e.g. by the Conference of the Parties), Parties are encouraged to establish national export quotas for CITES-listed species whenever this is relevant to the management and conservation of the species concerned. 9. As far as possible the period covered by an export quota should be the calendar year (i.e. 1 January to 31 December). 10. When export quotas are established, they should be set as a result of a non-detriment finding by a Scientific Authority, in accordance with Article III, paragraph 2 (a), or Article IV, paragraph 2 (a), of the Convention, and should ensure that the species is maintained throughout its range at a level consistent with its role in the ecosystems in which it occurs, in accordance with Article IV, paragraph 3. Export quotas for wild-taken specimens should be set at a level that takes account of the number or quantity of specimens that are taken from the wild legally or illegally. A non-detriment finding should be made whenever an export quota is established for the first time or revised, and reviewed annually. 11. Export quotas are usually established for specimens of wild source. However, separate quotas may be established for specimens of different sources (e.g. wild-taken, ranched, captive-bred, artificially propagated). An export quota applies to wild-taken specimens unless indicated otherwise. A non-detriment finding that supports the export of specimens of any specific source (e.g. ranching) should not be relied upon to authorize the export of specimens of other sources. 12. 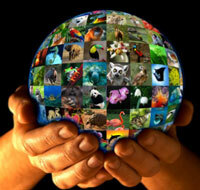 Export quotas are usually established for a specific number or quantity of animals or plants. However, they may be established for certain types of parts or derivatives (e.g. elephant tusks, caviar, skins, bark, sawn wood, bulbs). 13. To indicate the species for which quotas have been set, Parties should use the names indicated in the standard nomenclatures adopted by the Conference of the Parties1 . The approved names can be found in the most recent edition of the Checklist of CITES Species, which is updated after each meeting of the Conference of the Parties2. .
14. Terms used to define or clarify a quota (such as those indicating the type or source, when appropriate, of specimens to which the quota applies) should be used in accordance with agreed definitions contained in Resolutions of the Conference of the Parties or follow the guidance provided in the most recent edition of the Guidelines for the preparation and submission of CITES annual reports 3. 15. In accordance with Resolution Conf. 12.3 (Rev. CoP15), Parties should inform the CITES Secretariat of their nationally established export quotas and of revisions of such quotas. Such information can be provided at any time but, as far as possible, should be communicated at least 30 days before the start of the period to which the export quota relates. 16. If a Party establishes an annual export quota for a period other than a calendar year, it should indicate the period to which the quota applies when communicating it to the Secretariat. 17. When the Secretariat is informed about export quotas or revisions, it should publish them on the CITES website as soon as possible after they are received, with an indication of the date of publication. The publication should normally take place within 30 days of receipt. 18. When the Secretariat receives information about a quota for publication and it appears that there are technical problems, or it has questions about technical or administrative aspects of the quota needing clarification (for example, the standard nomenclature is not followed, there is an incoherence between the quota and available information on the species, past quotas have been regularly exceeded, etc. ), it should discuss these with the Party concerned before placing the quota on the CITES website. In such cases the Secretariat and the Parties concerned should try to resolve the issue as quickly as possible. Once it is resolved, the Secretariat should promptly publish the quota on its website. If the case is not resolved, the Secretariat shall publish the quota with an annotation to indicate its concerns and the issue will be taken up through one of the existing CITES procedures. 19. If any Party is concerned that a published quota may be too high, it should consult the appropriate Management Authority of the Party that established the quota regarding its concerns, in accordance with Resolution Conf. 11.18 on Trade in Appendix-II and -III species. 20. The level of an export quota reflects the number or quantity of specimens of a species that may be exported in any particular year (the specimens having been removed from the wild, bred in captivity, artificially propagated, etc., in that year). It sometimes happens, however, that, although specimens are obtained for export, it is not possible to ship them in the year in which they were obtained. 21. A Party may decide exceptionally to authorize export in one year of specimens that were obtained in a previous year, and under the quota for that previous year. In such cases, the quota for the current year should not be increased in order to include the specimens obtained in the previous year. Rather the number or quantity of such specimens that will be exported should be deducted from the quota of the previous year. 22. Every Party that has established an export quota is responsible for monitoring its use and must ensure that it is not exceeded. For that purpose, it should maintain data on the number or quantity of specimens actually exported, to be used as a reference when reviewing applications to authorize further exports. 23. The data from national annual reports of Parties are stored in the CITES trade database that is maintained by the UNEP World Conservation Monitoring Centre under contract to the CITES Secretariat. This database provides the basis for monitoring the trade and the implementation of the export quotas at the international level. *Amended at the 15th meeting of the Conference of the Parties. 1 The most recent list of adopted nomenclatural references is contained in Resolution Conf. 12.11 (Rev. CoP15). 2 The most recent was the 2007 edition at the time of entry into effect of the present Resolution. 3 At the time of entry into force of this Resolution (23 June 2010), the most recent Guidelines had been circulated with Notification to the Parties No. 2010/013.